This week I received one of the most exciting opportunities in my blogging career – to celebrate the 20th Anniversary with … (drum roll) Uh-Oh… The Teletubbies!!!! I watched the Teletubbies with my little kids when they aired on my local channels about 10 years ago. My friend, who lives in Europe, actually introduced me to this show. She told me that it is very popular in Europe and her and her son can not get enough of it. So later I was happy to find out that my local channels in the USA were showing it too. As time passed by, now my kids are older, but who can forget the colorful adorable fellas, that were about learning, colors, giving hugs and having fun? 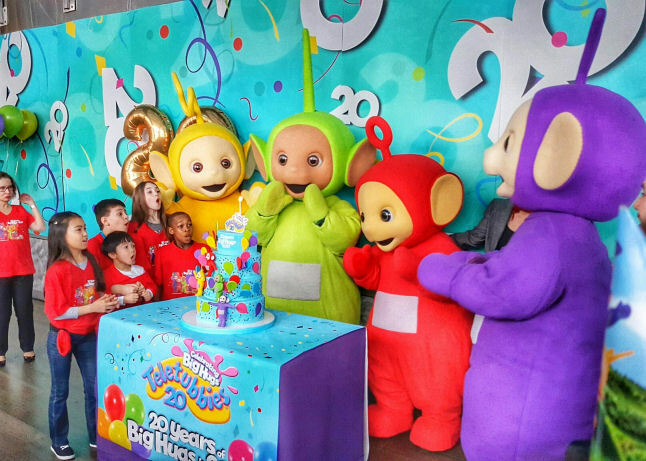 This is why I got super excited when I was invited to spend 2 days in New York City with Teletubbies and celebrate their 20th Anniversary! Wow.. time flies by fast…. 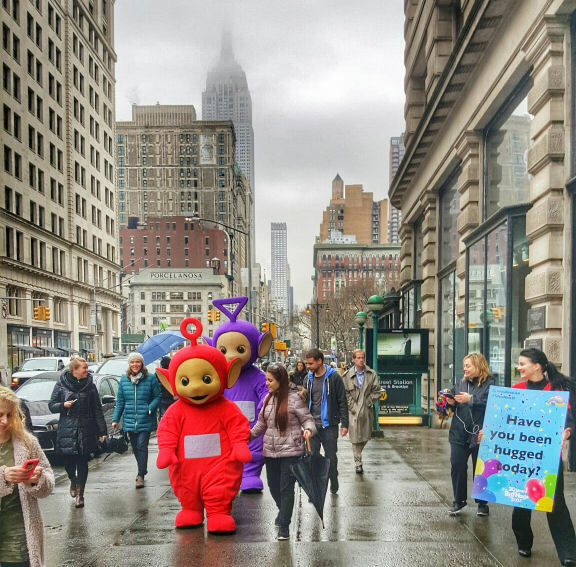 On March 27th, the Teletubbies came to NYC to celebrate the 20th Anniversary of the show. We welcomed and greeted them at the Marriott hotel in Brooklyn then we took 3 buses. Yes 3 branded colorful buses, two buses with Teletubbies in them and 1 minivan for myself and few other NYC blogger-friends. 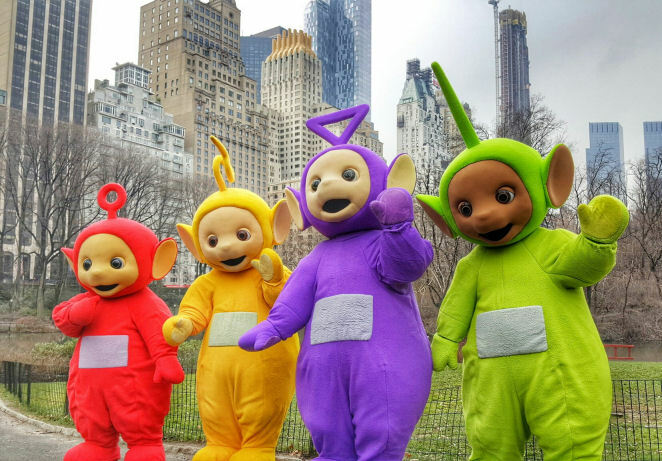 See my video recap of the Teletubbies in NYC and their 20th Anniversary party. 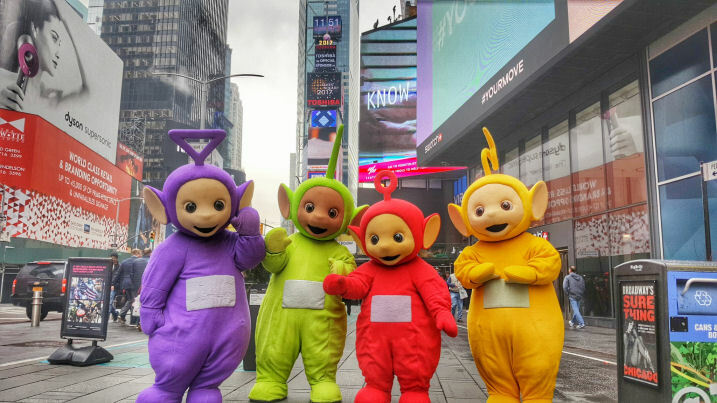 The 2 days in NYC were absolutely gray and rainy, but look how Teletubbies brightened the day and put a smile on everyone’s face. We drove and visited to some of the New York’s best known sites – including The Brooklyn Bridge, Flatiron Building, Times Square and Central Park. 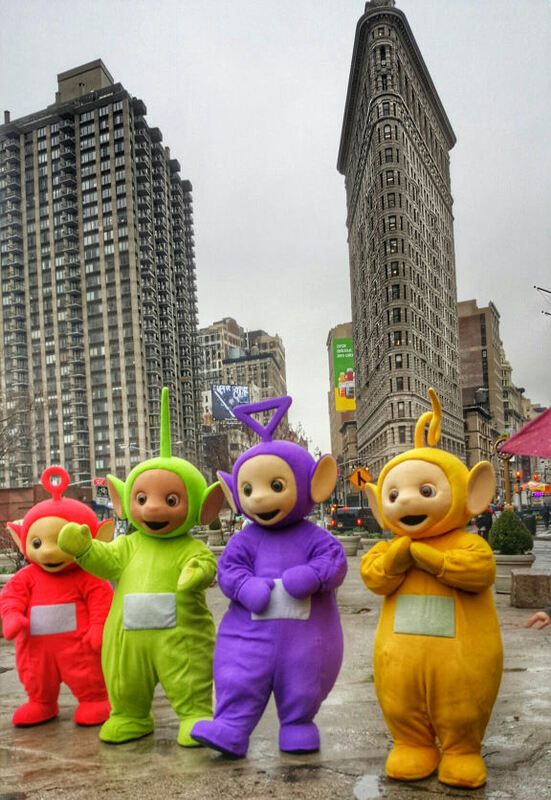 It was a blast to be on NYC tour with Teletubbies. At each stop Teletubbies gave their Big Hugs, to one another or to anyone who wanted one. They posed for photos and selfies. The following day, March 28 – is their actual birthday. This is when Teletubbies were launched 20 years ago and became a global phenomenon. On this day Teletubbies celebrated their 20th Anniversary with a #Teletubbies20 Gala in New York City. To coincide with the launch of the new series (that premiered on Nick Jr. in 2016) the new Teletubbies have touch-screen tummies, have a new range of cuddly, soft, plush toys, DVD that is available at all major retailers, and interactive learning apps that are available on the App store and google play. See my video recap (above) of the Teletubbies in NYC and their 20th Anniversary party. 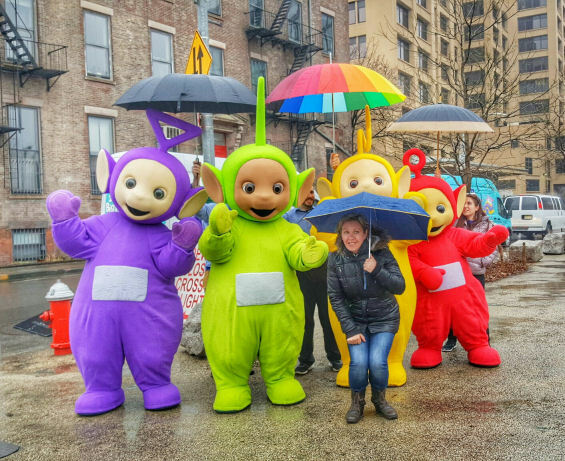 The 2 days in NYC were absolutely gray and rainy, but look how Teletubbies brightened the day and put a smile on everyone’s face. And don’t forget to tune to Nick Jr. to see the new episodes. Teletubbies are famous for their Big Hugs! Have you had a hug today? Let me know in the comments below if you watched the Teletubbies show with your kids and what do you think of Teletubbies? Disclosure: I participated in a sponsored campaign on behalf of Child’s Play PR for Teletubbies 20th Anniversary. « Harmless April Fools Day Pranks To Play On Your Kids! My daughters loved Teletubbies when they were little. My oldest daughter is living in the city. She probably would have loved to have seen them. LOVE these pictures! This brings me back to when my son was little and loved the Teletubbies! I can’t believe their 20 years old! Wow. I remember tell tinies when my brother was 3. Wow does that bring back memories! I didn’t know the Teletubbies were still around. What a cute show! 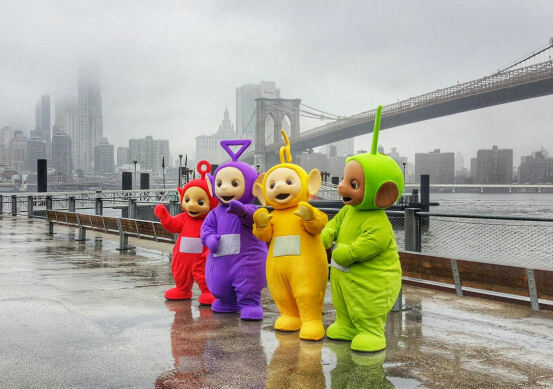 If I saw the Teletubbies walking around New York…I’d know I was in New York. I did watch the Teletubbies with my kids. I’ll admit it. I wasn’t personally a big fan, but I did enjoy the show for my kids’ sake. They loved it. So fun that they are coming back for a new generation. Wow, these four friends definitely take me back! I always found the Teletubbies to be super cute, so I think their return is wonderful. It’s been forever since I seen teletubbies. I think it’s an interesting show. Not my favorite but my kids loved it.